← What cuts are we opposing? A coalition of organisations representing the people who provide public services and those who use them has been launched to fight the public sector cuts taking place across the City and County. It will also spell out the alternatives to reduce the public sector deficit. 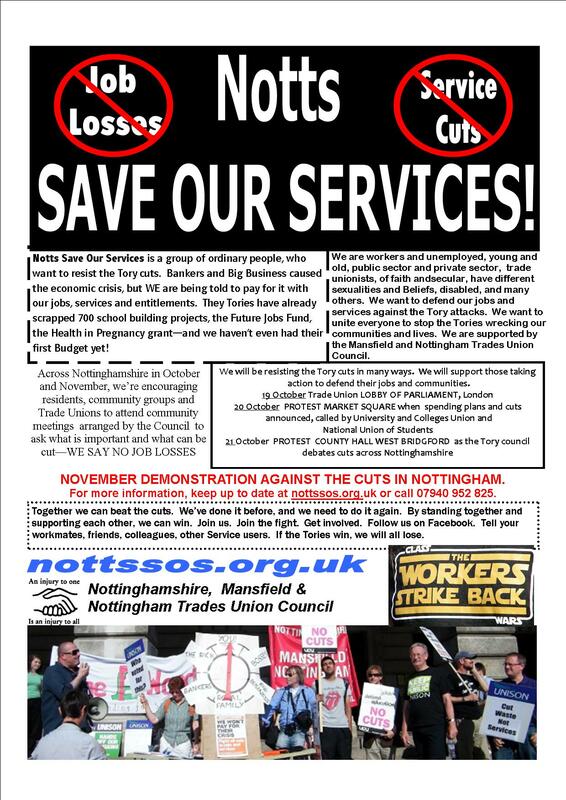 Notts Save Our Services (Notts SOS) campaign is launched today as millions of workers take to the streets across Europe in a Day of Action to protest against government-imposed austerity measures. Notts SOS will be taking action to fight these cuts and is putting forward alternatives. Many more alternatives that don’t hit working class families. 3 October 2010: Coaches leave Nottingham for the demonstration outside the Tory party conference in Birmingham. 11 October 2010: Next meeting of Notts SOS 7.30pm at the International Community Centre, 61B Mansfield Rd, Nottingham. 21 October 2010: Lobby of County Hall, West Bridgford from 12.30pm when the County Council is due to publicise massive proposed cuts and privatising most of its services. This entry was posted in Campaign info and tagged campaign, press. Bookmark the permalink. come on people – you can be more inspiring and interesting than this!